CS, Los Angeles: I have been reading PS for the last few months in an effort to educate myself on various matters of style. First and foremost, I want to thank you for the time and effort you put into your work in this area. I suspect that you have a day job (and I believe you mentioned having at least one daughter in a post), so, from the perspective of another young father-professional, your work is all the more impressive. Please forgive the bluntness, but I was hoping to get your views on why it is you chose the tailors you did for your first few British bespoke items. Is it simply the price range of the larger names that caused you not to try them out or is it a value calculation? Did you feel that you had the same options with Graham Browne that you might have had with a ‘bigger name’ shop? Dear CS, thank you for your question. I cannot afford Savile Row at this point in my life, so that limited my decision. But I have also over time learnt the various ways in which bespoke tailors – all of whom deserve the name – differ from each other. And that informs the value calculation. The first point to note is that the materials are all the same. Unless you want the exclusivity of Huntsman Opus or some such record cloth, you can find the same wools and linings at any bespoke house. Everyone uses Lesser, Minnis, W Bill etc and the same lining books. Second, the process is the same. Both GB and one of the more famous Savile Row names will take an equal number of measurements, create a unique paper pattern and cut the cloth by hand, creating a basted suit that will be ripped apart and re-cut, and remade for a forward fitting. Then the final suit will be made, which can be altered again. In this way they are both entirely different to made-to-measure. Assuming some minor changes are made at the final stage, this means visiting the tailor five times. Many Savile Row tailors will insist on more than this. That’s more expensive as it means more staff, more cutting and more time. But whether that is worth it depends on fit, which will be discussed later. Third, the style and design options are unrelated to price. Some tailors, such as Anderson & Sheppard or Huntsman, and more known for a particular style and are more likely to stay with it. Others have no particular house style, but dislike experimentation or anything out of the ordinary, as it takes longer. This is a question of personality rather than price. Russell and Dan at Graham Browne are always surprisingly excited about experiments – as demonstrated by both my and Guy Hills’ (of Dashing Tweeds) commissions. Some Savile Row tailors are equally impressive in that regard. So those are the similarities. What are the differences? Well, Graham Browne does a few things with a sewing machine rather than by hand. For example, it attaches the layers of chest canvas together by sewing machine. These are still not tight stitches, and the canvas as a whole is secured to the jacket by hand, to ensure movement, but that construction of the canvas would be done by hand at most good Savile Row houses. It takes ages. And so it is expensive. Personally, I love the way that my Graham Browne suits have adapted to my chest and feel personal. Far better than any expensive off-the-peg suit that had a floating canvas (Ralph Lauren Purple Label, for example). But a Savile Row suit might adapt better there – I don’t know, I’ve never owned one. Another difference is that Graham Browne does not make its own shoulder pads. They are pre-constructed. Unless you have unusual shoulders, though, I don’t think this makes a substantial difference. Lastly, and perhaps most importantly for the price, Graham Browne offers little after-sales service. They cannot sponge and press suits onsite. With good Savile Row houses, this is included in the price and can be done for years to come. And while GB would be happy to carry out minor alterations after the fact, it will not substantially alter and refurbish a suit several years down the line without some cost. Good Savile Row houses will – it’s part of the service. These last three points are all part of a value calculation, as you put it. They are all things that GB has opted to do without in order to charge less. And I’m perfectly happy with that – the construction is great and the fit fantastic, which are the priorities with bespoke. Then there is definitely a premium for a big name (however small) and it costs a lot more to have large premises on or around Savile Row. That’s obvious if you look at the prices of Savile Row-trained cutters that now work somewhere else in the country (like Thomas Mahon) or in smaller premises (like Steven Hitchcock). But, I think the most important thing you get, or should get with a Savile Row tailor, is consistency and quality of fit. Savile Row head cutters are at the top of their game. It is a prestigious position, and they are very good. You can have confidence that they will make you a very well-fitting suit, where you couldn’t with a smaller less-known name. It’s less risky. Not that the biggest names don’t sometimes get it wrong – but you’re on safer ground. You can also justifiably be more demanding on Savile Row (back to the idea of service), changing things or requesting more fittings. The tailor is likely to be more demanding on that score as well. There is a chance that there are tiny points of fit on a Graham Browne suit that would be improved on Savile Row. But I can’t see them and I’ve had suits made for a while now. I think Russell is a good cutter and others think so too. Would I have a Savile Row suit made if I could afford it? Yes, I would. But given that it would cost three times one from Graham Browne, I would have to be earning at least three times what I do now. You can follow the discussion on Reader question: Differences between bespoke tailors by entering your email address in the box below. You will then receive an email every time a new comment is added. These will also contain a link to a page where you can stop the alerts, and remove all of your related data from the site. Simon – more nice work. Are you able to give an indication of GB’s price for a 2 piece suit. I’m based up north, so was thinking maybe of using Steed or the English Cut. I’m a big fan of pal Zileri for rtw, and following recent articles by you picked up a Chalk Stripe Sartoriale at Bicester for $ 400. Very light weight, so not an every day one , but probabaly £2k less than Bond Street ! GB costs £850. Do a search on the site for more posts, and check the comments in particular for details on GB. First of all I want to congratulate you on a superb site! I have one question regarding your experience with GB: do they have the type of quality fabrics that Kiton uses? For the past few years I’ve been buying heavily discounted Kiton sportcoats because of the extremely luxurious feel of their fabrics, but the fit is not always spot on. So I decided to search more affordable bespoke tailors that can source that kind of quality cashmeres and cashmere blends in the beutiful paterns that Kiton uses with no luck so far. At more famous bespoke houses the price is way out of my reach, as they are in the same league as Kiton full prices. GB has access to every English mill and others, Scabal, Zegna, Cacciopoli etc. But many of the Kiton fabrics are exclusives, so you won’t necessarily find the same thing. Go for an Italian brand like Zegna and you should find something comparable. It sounds like you have quite a few areas covered James! I would say that if GB is a step for you, don’t go for anything new, though perhaps a double breasted? Simon thanks Pehaps navy herringbone DB? 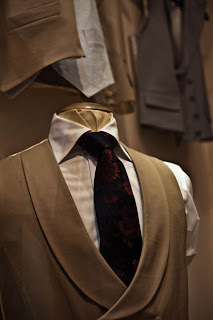 As a young man considering his first foray into the made-to-measure or bespoke world and, at that, confused as to whether or not to go to Savile Row or elsewhere, this is a very interesting post. I would be even more interested to know your updated thoughts on these `value calculations’ now that you have a few pieces from some of the big Savile Row names. From chatting with some people, not everyone (on the Row!) would agree that “the process is the same”. Would you still? as you say, the materials) are the same, then how much value have you attached personally to the other details? Is there any feeling that you could have essentially got your Savile Row pieces from e.g. Graham Browne? Or is there a sense in which you have truly now come to appreciate the hand-made shoulder pads, hand-sewn canvas layers and availability of after care? Or is there even more to it than that, i.e. the whole process is more careful and pleasurable and the whole garment just that much better all over? I think there are two elements. The work is certainly different at a Graham Browne than a Row tailor, as the chest at the latter is sewn by machine, which saves a lot of cost; the finishing generally is also not as good. The cutting, however, should be the same, and yet it is not. My Savile Row suits generally fit better than Graham Browne or similar tailors. I think this is largely a question of time. Somewhere like GB survives on volume – this is why it can charge so much less, despite having the same materials costs and not-far-off coat maker costs. In January I will be visiting Venice for a few days, but with no opportunity to travel further afield in northern Italy, unfortunately. Given your travels in the country, is there anywhere of sartorial interest in Venice, that you are aware of that Ishould look out for during my visit? I think the site and its ideas are just superb, by the way. All cheaper tailors make new customers (i.e. new to bespoke) believe that they get a similar product to a fraction of the price of Savile Row. But there are shortcuts every where and the problem is that as a novice to bespoke you will not notice them. A fitting takes 15-20 min at Graham Browne while customers walk in and out, but a fitting takes an hour at Savile Row “because there is so much there can go wrong”, as a cutter said. The same fabric? No. At GB and the likes there seems to be little or no shaping of the cloth by shrinking and pressing techniques, thus the cloth feels like a potato sack. An individual pattern? I found there is little consistency in the work of cheaper tailors. Out of 6 pairs of trousers only 2 fitted right from the start. The last pair was a checked cloth, which GB made up against an extra charge. The trousers were too wide at the seat, but too slim at the legs and there was not even enough cloth in the side seams to lay them out. Later a Polish alteration tailor spontaneously said: “Oh, your trousers are cut the wrong way.” It then seemed the lines of the checks did not run down in a straight way. I then asked: “What reason can the tailor have had?” “No idea. But at least it saves cloth”. I really have no intention to speak badly of GB, but customer be warned when they tell you that there is no reason to go to SR: you really get a reduced product from them in all respects, not only in price. There are very often shortcuts with cheaper tailors. There is also a definite correlation between price and quality in tailoring – though it is by no means perfect. However, we cannot assume that a cheaper tailor necessarily makes a cheaper product. Particularly, as I have pointed out, when half of the process is exactly the same. Finally, I’m not quite sure I can be called a novice. I’ve had suits made at over 30 tailors around the world over the past 10 years, witnessed the workshops of nearly all of them, and investigated every aspect of suitmaking.